Our latest paper, available here, makes two important contributions to project management theory and practice within large-scale safety-critical projects. First, we extend the theory of high reliability organising from the high-tempo operational context into the slower paced, yet still complex and highly-consequential environment of the safety-critical project. Secondly, our research found evidence of many practices in safety-critical projects that are consistent with high reliability project organising in response to uncertain situations. However these practices were often fragile, emergent and contingent and less deeply embedded within the host project organisation than proponents of high reliability theory might wish for. What is a high reliability organisation? A number of authors have sought to characterise HROs (Boin & Schulman, 2008; La Porte, 1996; Roberts & Rousseau, 1989; Weick & Sutcliffe, 2007) as organisations that can maintain safe and reliable operations, while operating under considerable time pressure in high-risk environments. To date, however, most research into high reliability organisations has focused on high hazard operations and there are few empirical studies of high reliability organising in the project context. In an earlier paper I argued that safety-critical projects were sufficiently similar to their operational counterparts to permit theories of high reliability organising to be translated into the project context. 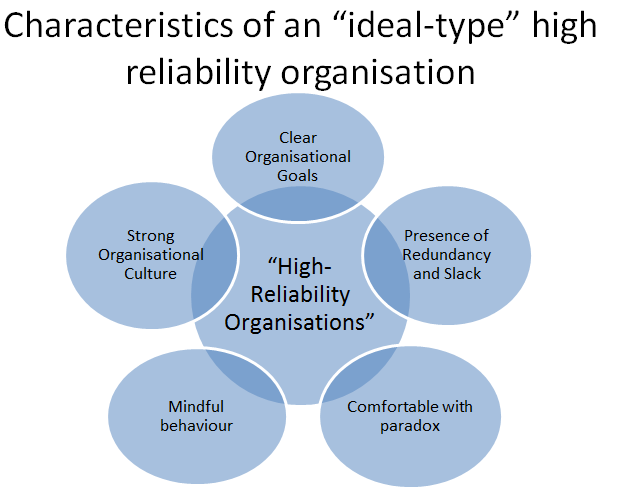 I also synthesised an “ideal-type high reliability project organisation” which comprises five main features: clear organisational objectives, a strong organisational culture, the presence of redundancy and slack, mindful behaviour and the ability to prosper in the paradoxes. Our latest paper discusses the first empirical testing of these ideas, based on interviews with 30 project management practitioners on nine large-scale safety-critical projects in the civil nuclear and civil aerospace industries. We found evidence of many practices in safety-critical projects that are consistent with high reliability project organising. Our respondents expressed a sense of balancing and juggling in the paradox, for example, in knowing whether to test new engines for flight or run further experiments; and provided evidence of learning, acting mindfully, avoiding over-rigid processes, and of upholding constructive tensions, conceptual slack and close interdisciplinary working. However these practices were often fragile, with much depending on the tenacity and strength of will of individual project managers, rather than being embedded in the organisation’s culture. The challenge facing safety-critical projects is how to identify, develop and nurture sufficient numbers of such individuals who can begin to change the organisation’s long established ways of working. High reliability practices in this study also often emerged in response to situation-specific difficulties as opposed to being planned for from the start, and occurred at the project operational level, rather than being mandated by senior management. One implication from this study is the need to increase senior management awareness of the principles of high reliability project organising without this becoming merely the latest management fad. Lastly high reliability practices in dealing with uncertainty were contingent (localised) to particular sets of circumstances, organisational structures and individuals, and were hard to influence beyond the core project team. Structural factors in both civil nuclear and aerospace often thwarted attempts by project managers to act in a manner more consistent with theories of high-reliability project organising. For example, complex ownership structures, the quasi public-sector nature, and short-term incentive mechanisms in the civil nuclear industry can tempt organisations to adopt short-term financially expedient project solutions. Oedewald & Gotcheva (2015) argue that it is difficult to delegate decision making in large nuclear projects as they are typically structured around long and often fragmented networks of contractors and subcontractors, not all of whom have specific nuclear industry expertise. And in civil aerospace, the commercial imperative to deliver safe engines to tight customer deadlines can lead to suboptimal resource allocation, reactive responses to emerging problems and a pervasive organisational culture of firefighting. These are structural issues that reside beyond the sphere of influence of even the largest, most consequential safety-critical project. This study also identified a number of sectoral differences between civil aerospace and nuclear projects. There was more evidence of practices associated with high reliability project organising in civil nuclear projects particularly in terms of having a stronger sense of mission, clearer objectives and core events that had to be precluded, in reporting mistakes openly and affording areas of ignorance in the project the same importance as areas of certainty, in better separating technical and cost delivery, and of a lack of complacency and being attuned to small changes that could be the precursors to larger issues. In civil aerospace projects there was considerably more emphasis on the tempo of projects, and on avoiding over-rigid processes. There was virtually no evidence of practices at odds with high reliability thinking in civil nuclear. This differed from civil aerospace, where there were several instances where objectives were not clearly communicated, of complacency and slow initial reactions to emerging uncertainties. There are a number of wider implications of this study. Firstly there remains the risk that high reliability project organisations are viewed as somehow ‘heroic’; embodying cultures and cognitive processes that enable high reliability projects to outperform non-high reliability projects. This study has provided no empirical evidence of this, given that we did not set out to link the characteristics of high reliability project organising to improved project performance. A second issue raised by this study is the transferability of prior high reliability organising research from the operational context into projects. Safety-critical projects do share many similarities with ongoing operations, notably their complexity, consequential nature, the presence of uncertainty and the marshalling of many specialist resources to enact organisational processes to deliver a set of objectives. However there are a number of differences between operations and projects, including the more measured tempo at which projects proceed and the temporary and non-routine nature of the work. In our view, there are sufficient similarities between operations and projects to permit the overlaying of high reliability theory onto project context– provided researchers remain cognisant of the limitations of high reliability theory. A final question raised by this study, and one that we have not yet adequately answered, is the extent to which the characteristics of high reliability project organising are unique to safety-critical projects as opposed to constituting good practice in any project context. For example, learning from past projects, clarity of objectives and close interdisciplinary working are all aligned with good project management practice across all sectors. In this regard, our findings that many practices in safety-critical projects are consistent with high reliability project organising are perhaps not so astounding. However, we would argue that the highly- consequential nature of large scale safety-critical projects and the imperative attached to their safe execution, render the practices of high reliability project organising essential, even if that comes at the increased cost and effort of providing redundancy and conceptual slack and of maintaining a razor sharp clarity of focus on safety over other performance objectives. Boin, A., & Schulman, P. (2008). Assessing NASA’s Safety Culture: The Limits and Possibilities of High-Reliability Theory. Public Administration Review, (Nov/Dec), 1050–1062. La Porte, T. (1996). High reliability organizations: unlikely demanding and at risk. Journal of Contingencies and Crisis Management, 4(2), 60–71. Roberts, K. H., & Rousseau, D. M. (1989). Research in nearly failure-free, high reliability organizations: having the bubble. IEEE Transactions on Engineering Management, 36(2), 132–139. Weick, K. E., & Sutcliffe, K. (2007). Managing the Unexpected. San Francisco: John Wiley and Sons.